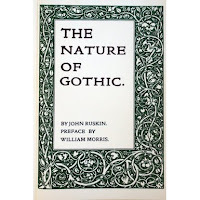 I’m glad to report that a paperback facsimile edition of the 1892 Kelmscott Press version of John Ruskin’s The Nature of Gothic – the first ever made of this rare book - has just been issued by Pallas Athene Arts. This publisher, which operates at the high-cultural end of the travel books market, ranges over history, art and architecture as well as travel, wine and food, and has a strong Ruskin list among its offerings. 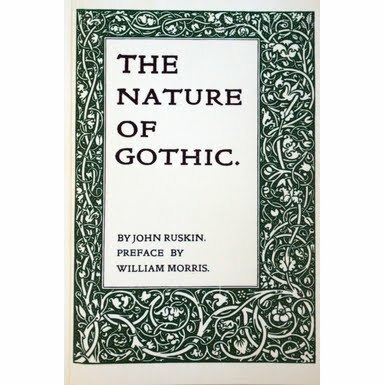 This attractively produced Nature of Gothic volume contains Morris’s Preface to Ruskin’s chapter, in which he grandly describes it as ‘one of the very few necessary and inevitable utterances of the century’. The Ruskin text looks formidable on the page in Kelmscott Golden Type with flamboyant Morrisian initials, and Afterwords by Robert Hewison and Tony Pinkney conclude the book. Pallas Athene’s commercial logo is a quaint little square-shaped owl, who might remind us of Hegel’s great claim that ‘the Owl of Minerva flies at night’, i.e. you can theorise only what has already been achieved in practice. Ruskin powerfully theorised the medieval architectural past for Morris and deeply shaped the latter’s life in so doing. But, as Morris knew, we have to theorise the future as well as the past (or it will never come into being in the way we want in the first place), so I suspect that today we will need a Society for the Protection of Future Buildings quite as much as Ancient ones. Oddly enough, I can't find the book on the Pallas Athene website, but it does show up on Amazon and copies were on sale in the V&A bookshop the other day, so it definitely does really exist! ISBN 978-1-84368070-3. I see that Hegel's owl crops up in Morris criticism too, when James Buzard neatly describes 'News from Nowhere' as 'a kind of Minerva's owl for the novel, showing us in bold relief the contours of a form whose day, it hopes, has passed' ('Victorian Studies', 40:3, Spring 1997, p.447).